The UTEP Dinner Theatre provides funds and mentorship to qualified students, enabling them to mount a fully produced musical in a specially configured set up inside the UTEP Dinner Theatre. No meal is served for this production. You’re a Good Man Charlie Brown is a student directed, designed, produced and acted production. It is not a typical Utep Dinner Theatre production. No meal is served, all seats are general admission and the show takes place at the Utep Dinner Theatre but in a special “black box” configuration with only 100 seats available for each performance. The fact this is a low budget student production is why the tickets are priced so much lower than regular UTEP Dinner Theatre shows at $10.00 for the general public and $5.00 for UTEP Students. 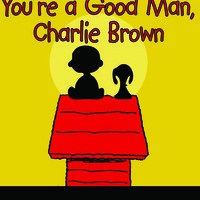 You’re a Good Man Charlie Brown (Revised) is a fresh approach to the 1967 classic, based on the beloved comic strip by Charles M. Schultz. Sally Brown joins Charlie Brown, Linus, Lucy, Schroeder, and Snoopy in this charming revue of vignettes and songs. Two new songs, Beethoven Day and My New Philosophy, have been added to the twelve numbers from the original version, which include My Blanket and Me, The Baseball Game, Little Known Facts, Suppertime, and Happiness.